...and at least four corner beds at intersections. I love, love, love the elephant's ears! 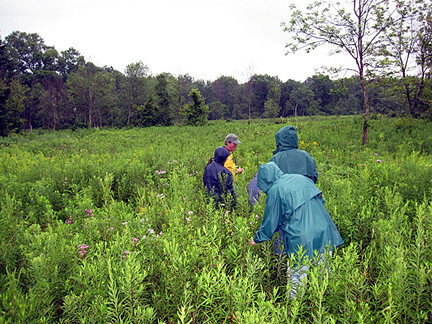 We then carpooled to the fen, which is being maintained by the Nature Conservancy. 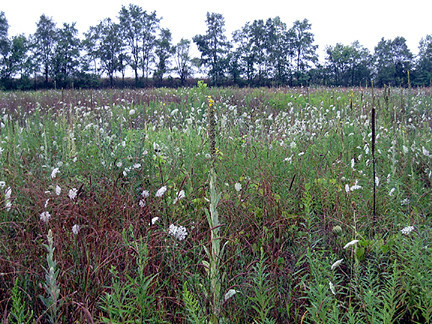 According to the Michigan Natural Features Inventory, a prairie fen is a wetland community that occurs on moderately alkaline organic soil where cold, calcareous, groundwater-fed springs reach the surface. 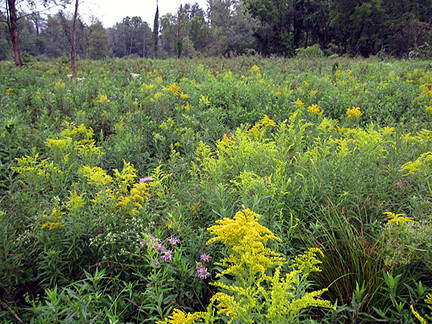 The flow rate and volume of groundwater through a fen strongly influence vegetation patterning; thus, the community typically contains multiple, distinct zones of vegetation, some of which contain prairie grasses and forbs. Apparently the rare Blachard's cricket frog also calls at Ives Rad Fen, but not at this time of year. 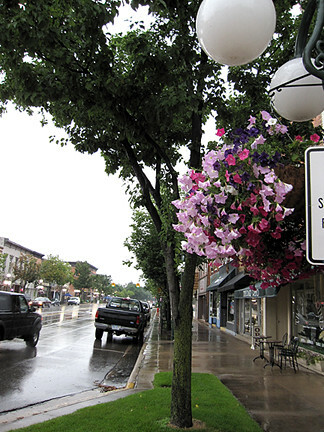 All plants here are native to Michigan, except where noted. Disclaimer: I'm still getting to know my new camera. I discovered that while I know how to override the flash and use the macro feature, I don't know how to get both to work together at the same time which meant a lot of photos were washed out or blurry. Plus, it was a bit difficult pulling my camera, notepad, and pen in and out of my rain poncho (jot, jostle, drip, smear) while watching where I was walking (slippery! uneven terrain!) and not holding up the people behind me. 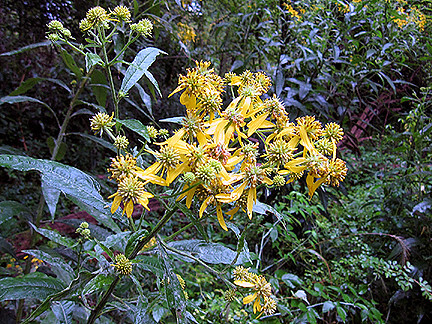 ...and those often occur on tall goldenrod, making IDing easy. Thank you, Nature! 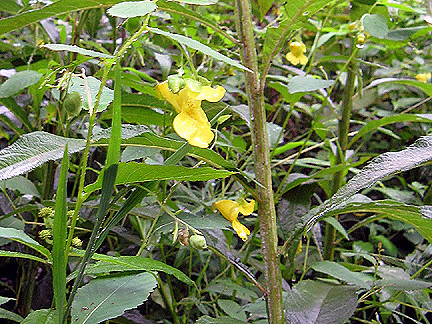 ...there was the more unusual yellow jewelweed. Virginia stickseed or sticktight (Hackelia virginiana) is a cool plant that gets bur-like and sticks to your clothes when the seed head dries. Only one flower blooms at a time. ...or on its own. 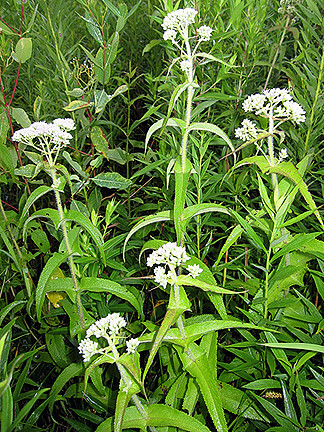 Boneset gets its name because native Americans used it to help set broken bones. You can see at the bottom of the photo that the leaves join to the stem, so it was thought the plant helped bones join. Here's our friend Joe-Pye weed (Eupatorium fistulosum). Noogie! I have some in my own garden. 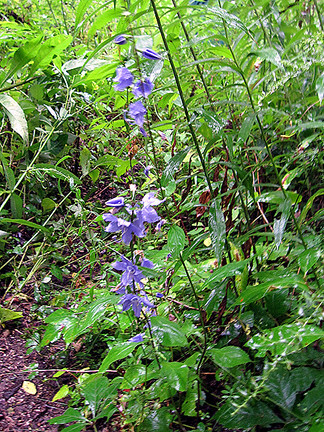 Great or blue loebelia (Lobelia siphilitica) is quite striking. Spreading dogbane (Apocynum androsaemifolium) has white flowers (past bloom) and distinctive red stems, which get redder as the season goes on. 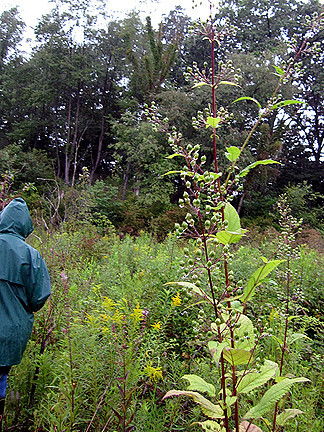 I'd never heard of horse balm (Collinsonia canadensis) and it's at least 9 feet tall. I like the rain droplets on the seedpods (click for flower in bloom). 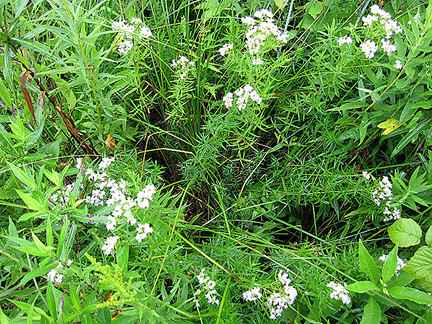 Slender mountain mint (Pycnanthemum tenuifolium) is also in the prairie at the Furstenberg nature area. 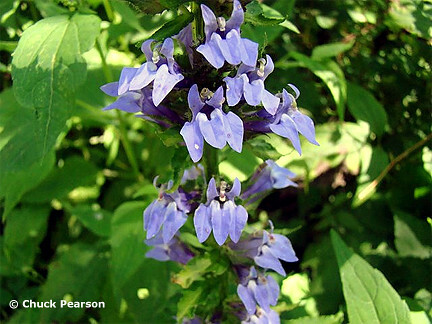 Tall bellflower (Campanula americana) is a stunning shade of blue. ...stinging nettle (Urtica dioica) is also cute but has hollow hairs on its stem and underneath its leaves, which can irritate the skin if brushed against.. It's not native. 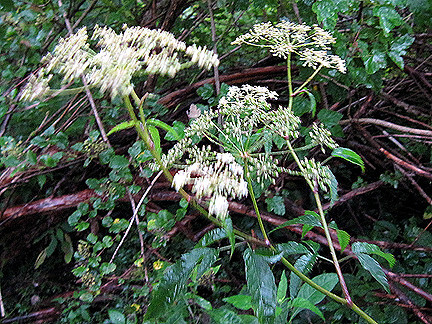 Spotted water hemlock or cowbane (Cicuta maculata) — danger, danger Will Robinson! 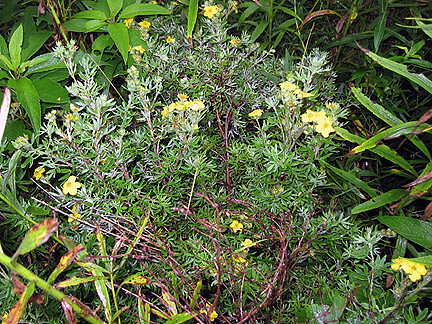 If swallowed, this plant is fatal or causes permanent neurological damage of the central nervous system. Now, poison sumac (Toxicodendron vernix, formerly Rhus vernix) won't kill you but its reaction on the skin is so severe it makes you wish you had poison ivy instead! 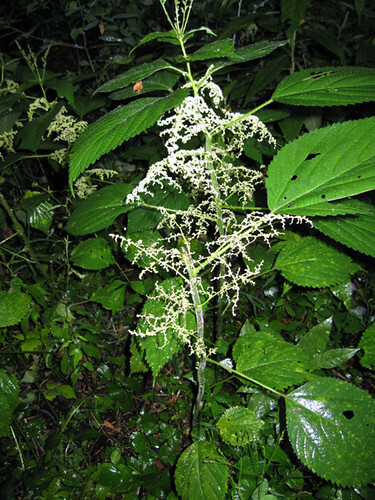 It has green berries deep in the foliage, which turn white. The flowers/berries form on a red rachis. 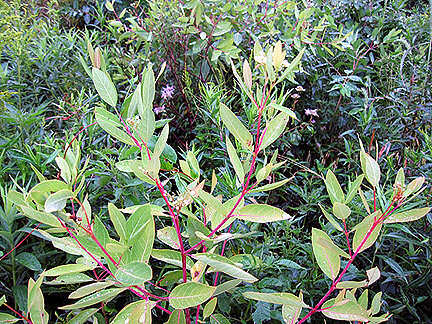 Also its stems are smooth whereas non-poisonous sumacs have fuzzy stems. 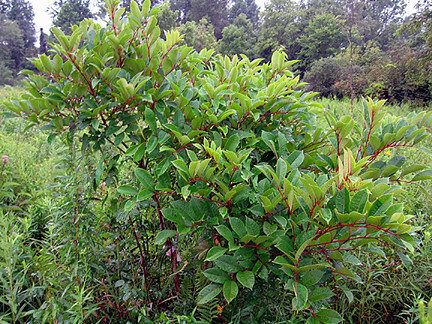 Most notably, poison sumac grows in wetlands (such as swamps, bogs, and fens) and not in uplands. 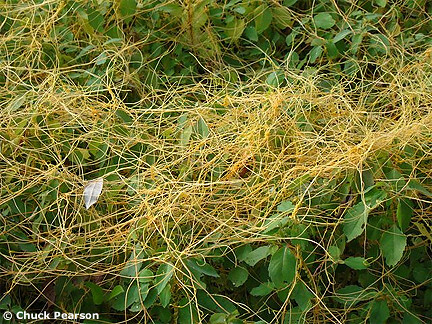 Moving now from poisonous to unusual, dodder (Cuscuta sp.) 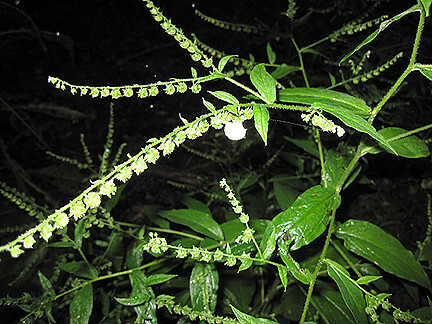 is a parasitic flowering plant that has no chlorophyll so it attaches itself onto other plants and "leaches" off them. 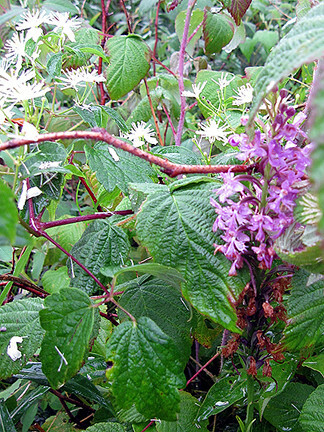 Virgin's bower (Clematis virginiana) with purplefringed orchis (Habenaria grandiflora), noogie noog! 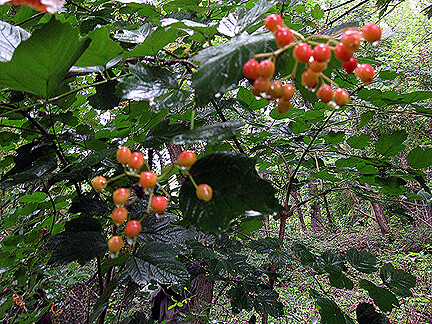 Highbush cranberry (Viburnum trilobum), so sweet, as are all Viburnums, imho, with their flowers, fruit, and fall foliage color. Wingstem (Verbesina alternifolia) is not only a cool yellow flower (waves to Tina! ), but it gets its name from the leafy edges (or wings) down either side of the stem. It's easier to see them here. And, finally, we circled back through yet-to-be-managed/cleared fields, rich in two non-natives, queen Anne's lace and a personal favorite, mullein (Verbascum thapsus, waves to Pete). Despite wearing a rain poncho (thanks, Karen, for lending it to me! ), I was completely soaked (both from falling rain and from brushing up against wet foliage, some taller than me) and completely happy at the end of the hour-and-a-half walk. I'm so excited to have seen a fen. I was expecting it to be more like a bog, where the ground is spongy (and acidic) and the foliage is mostly low. It was a great trip in a great place, that is being well cared for by the Nature Conservancy. Those are wonderful pictures! I love the elephant ears too. 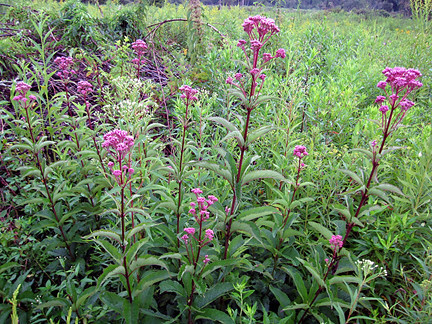 OK, Joe Pye Weed is going on my list of plants I want to try. What a great time. You saw so many interesting plants. I have always wondered which plant was poison sumac. Now I know. I hope to never come up against it. For some reason, I've never heard the word 'Fen' associated with North America before. Was that walk only an hour and a half! It looked as if it would take at least a day to see so much. You are assembling quite a reference base on this blog! The Boneset - the joins between the leaves and the stem are the kind of thing which one peers at to try to work out. The Poinsonous Sumac - it features prominently in the early part of Bill Bryson's 'Life and Times of The Thunderbolt Kid' (which I recently read). Now I know it really does exist! The Horse Balm is specially impressive. I'd like to see one of them. And I'd like to meet a Hemlock in person so I could make sure never to meet one again. An extraordinary and riveting post, Monica. What a wonderful place to visit! I like the hedge nettle. There are so many interesting plants in your photos, many of which are around in the UK also, but I have probably not seen yet. What great photos! Looks like a place that's worth putting up with some rain for! 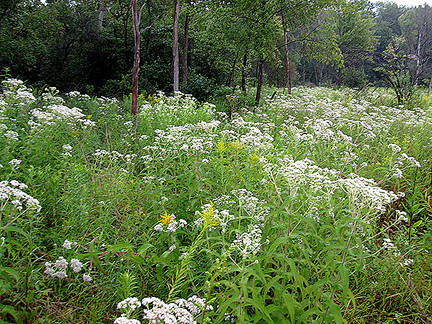 Loved the field of boneset, never knew boneset could look so good! 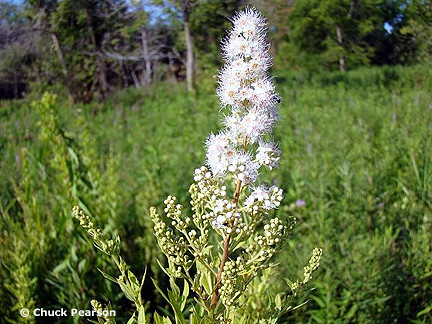 KUDOs on knowing your goldenrods too! This is so interesting and informative. But I must say I am glad to be able to view the fen from the comfort of the home-no rain for me! Picture me waving back to the wingstem. I want it here in my garden now. This would be my kind of trip. What fun! This is so interesting, Monica, and I'm very impressed with your identification of all these plants. Even with my wildflower book in hand, I still can't i.d. 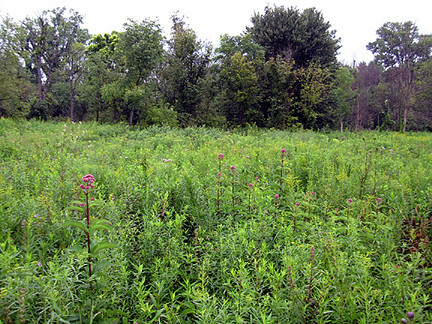 so many of the prairie and wildflowers:) By the way, my Joe Pye weed's blooms are pink, after all, so I do hope that is what I have. I had no idea there were fens in the Midwest; of course, Michigan has a lot more water area than here in Illinois. Thanks for the warning on poison sumac--I've had enough of poison ivy this summer! The fen looks like a beautiful place, and so much diversity. I love the Spirea alba. 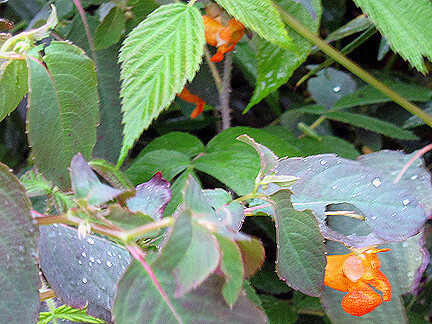 Lucky Faerie, Spotted and Pale Jewelweed in the same area. The closest yellow jewelweed I know of is 200 miles away. I will be getting seeds this year. I'll find out if they cross next year. Great post, Monica. 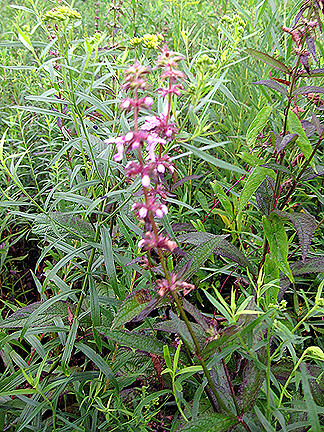 Horse balm, that's a new one;) Some of the plants are familiar from a wetland restoration project I was involved in years ago. Very interesting and I love seeing the photos. Love all those wildflowers. Goldenrod together! 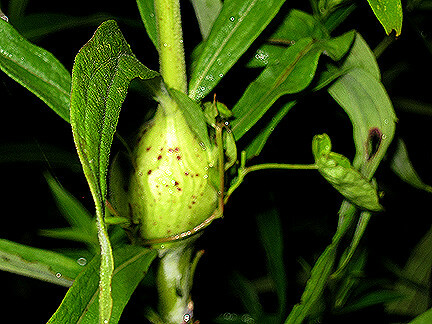 I did read that the galls can have insects inside and that some creatures feed on them. 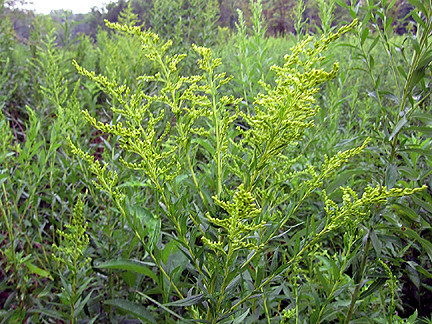 I didn't find any galls on my goldenrod. Great walk and photos look wonderful. I love fens, probably because of all the plants in them that I can't grow. I love the Cow Parsley & the Joe Pye Weed, but I even like the Poison Sumac because of its stunning fall foliage. Photography in the rain & mud is always challenging, but you did a great job with it. What a great field trip to the Fen. I loved the I.D. 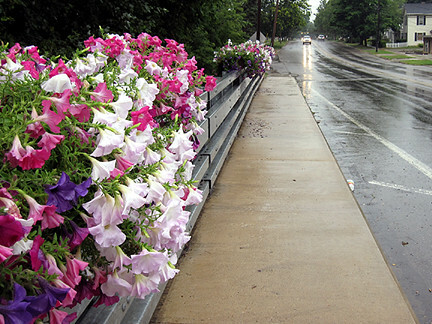 's on all the plants but most of all I loved looking at the wet stuff that I vaguely remember as being rain...lovely! We've been having some hot and dry weather around here. So I was surprised by the first picture of people in rain gear! Loved the tour. 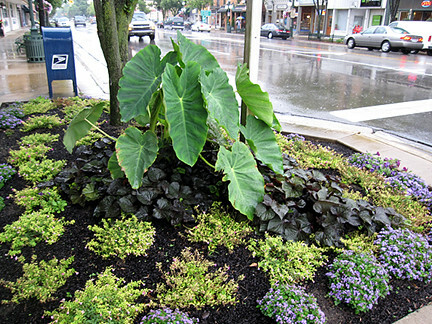 I think by the end of the season your blog may inspire me to garden with more natives. Your pics make them look as interesting as any of the non native I'm drawn to. Send some rain my way, the garden needs it. Fantastic field trip, and wonderful post Monica! I appreciated all the plant IDs. I'd never heard of a fen before, but you've inspired me to learn more about them. I second MBT's request to send some rain our way!